Trees can pack a big punch when it comes to reducing stormwater. But Robert Elliott, former Columbia University (New York) graduate student and co-founder of Get Urban Leaf (New York), believes there is untapped potential for using trees to manage runoff in cities. He led a university study that provides urban planners with information that can help increase this potential. While many of New York City’s 684,000 street trees were installed for their aesthetic benefits, they also capture stormwater, a benefit that could be enhanced by installing tree-pit guards. Robert Elliott. Most city-dwellers have seen trees growing out of tree pits along walkways and streets. 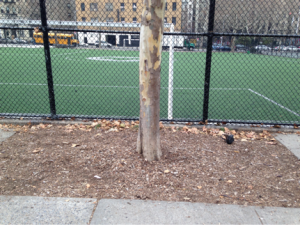 Soil permeability in tree pits can affect the amount of runoff that can be absorbed. 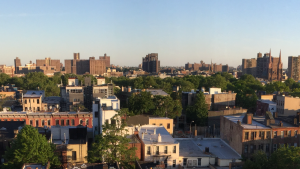 A team of Columbia University researchers examined the elements of tree pit design and management to identify ways to improve their stormwater infiltration. The researchers found that the most significant factor influencing infiltration rate in tree pits was the presence of a guard between the soil and concrete. Tree pits with a barrier blocking pedestrians from walking on the soil experienced significant increases in the amount of runoff absorbed. “I was surprised at the magnitude of installing a guard and how quickly that infiltration was recovered,” Elliott said. Guards were installed in 2014. By 2015, researchers saw an “8-fold increase in infiltration capacity,” he said. The team examined infiltration rates at 40 tree pits with various physical conditions common in New York City. They observed the presence or absence of a guard; mulch, and ground cover plants; the elevation of the pit’s soil in relation to the sidewalk; and size of the pit and tree. After studying 40 tree pits throughout the city, researchers determined that a barrier to prevent pedestrians from compacting soil in tree pits proved the most beneficial for stormwater infiltration. Robert Elliott. Elliott was especially surprised to see that installing tree guards provided the most significant benefit, far above adding ground cover plants that could help open up the soil, or even the tree’s health, he said. The study, “Stormwater infiltration capacity of street tree pits: Quantifying the influence of different design and management strategies in New York City,” was published in February in the journal Ecological Engineering. Since 86% of New York City’s 684,000 street trees do not have guards, this change can make a big difference. But Elliott thinks there’s more that can be done with trees to obtain a more natural “urban hydrology,” he said. 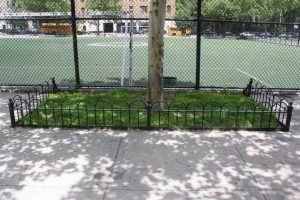 Elliott joined other Columbia University researchers in conducting another study comparing the costs and benefits of guarded tree pits with bioswales. He wanted to compare the benefits of retrofitting tree pits with the city’s strategy to build bioswales anywhere possible, he said. In this study, researchers modeled the installation of tree guards in the Harlem River watershed. The area contains nearly 20,000 street trees and only 6% currently have guards. Guard installation is estimated to capture an additional 31,416 m3/yr (8.3 million gal/yr) of stormwater. Installing a guard around a tree pit increased the amount of stormwater infiltration 8-fold. Depending on the runoff area, a guard can increase a single tree’s stormwater infiltration anywhere from 1264 L/yr (334 gal/yr) to 4285 L/yr (1132 gal/yr). Robert Elliott. Tree pits often will not overflow unless rainfall occurs quickly. Installing tree guards becomes beneficial when rainfall levels exceed 5 mm/h (0.2 in./h). And this installation remains less cost-effective then a bioswale unless the storm intensity is 9 mm/h (0.35 in./h) or higher, the study says. While bioswales often are more cost-effective, retrofitting tree pits for stormwater management may be a beneficial strategy, Elliott said. Incorporating bioswale design elements such as a curb-cut into the tree pits would increase the impermeable area that can drain to these areas while maximizing infiltration. Installing less expensive guards around pits or involving the community in building their own guards could help improve cost-effectiveness of using tree pits for stormwater management, he said. Thank you for your blog. It is wonderful to see the massive impact of such simple measures! I personally think this will be more beneficial to emerging Urban Markets in India for example. As India is redesigning /improving Urbanscape of 100 cities. The scope and comercial potentential of such Bio Engineeringmeasures is unbelieveable. Consider contributing to the cause. You can contact me if you so decide.